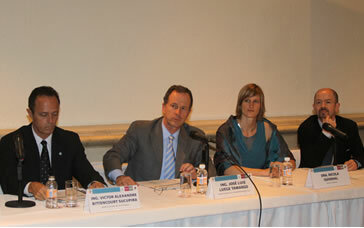 On May 11, 2011, Dr. Matt Hare and Dr. Nicola Isendahl presented the work of the EU FP7 project NeWater to the Conference “formation/ training for change agents” in Mexico City to 500 representatives of Mexican academia, environmental groups, water utilities, State Water Commissions and Legislators. Opened by José Luis Luege Tamargo, Director General of the Mexican National Water Commission (CONAGUA), the conference was part of an ongoing participatory process that CONAGUA has set up to convert influential members of Mexican society into promoters and facilitators of CONAGUA’s drive towards further developing the integrative, sustainable and adaptive nature of Mexico’s water governance. A development embodied in the bold initiatives for change contained in the national framework Agenda del Agua 2030, approved by President Calderon earlier this year. NeWater got involved thanks to the quality of the work promoted on its website. The consulting firm, Infinita Consulting working as enablers for the Conference, got in touch with Prof. Claudia Pahl-Wostl, on behalf of CONAGUA, after reading about the outcomes and products of the NeWater project. As a result, CONAGUA invited NeWater to present the theory, tools and practical examples of adaptive water management in the first session, which was wholly dedicated to NeWater, in order to set the scene for discussions and talk for the conference. The rest of the day was taken up by other experts from Brazil and Mexico discussing state-of-the-art approaches to integrated and adaptive water governance in their countries. The 1.5 hours long presentation of NeWater in Spanish, to which NeWater experts around the world contributed, can now be found in the NeWater online curriculum (www.newatereducation.nl). Its 112 slides contain information and lessons learnt about adaptive water resources management tools and approaches adopted in seven river basin case studies (Amudarya, Elbe, Guadiana, Nile, Orange, Rhine and Tisza) and over 20 references for further reading. As such it serves as a valuable Spanish-language teaching resource about Adaptive Water Resources Management. It is also the first comprehensive overview of the ideas, tools and results of the project available in Spanish. On the following day, 12th May, over 120 staff members of CONAGUA then took part in a hands-on workshop run by Matt and Nicola. The workshop’s goals were to provide CONAGUA implementers of the Agenda del Agua 2030 with an opportunity to learn more about the use and relevance of AWRM and participatory tools that had been discussed the previous day, in resolving typical management challenges they face. After training 13 CONAGUA facilitators, the previous evening, the participants were facilitated in a large-scale group model building activity, designed by Matt, aimed at learning about and testing this participatory tool (a tool used in most NeWater case studies) as a way of developing common understanding about the management system and identifying adaptive, integrated solutions to complex problems ranging from flood and drought management to maintaining groundwater supplies. There were a lot of positive reactions to the presentation as well as the group model building workshop and enormous motivation and curiosity to implement further adaptive management approaches in Mexico. The events of May 11-12th demonstrate the continued international importance and impact of well run EU FP7 projects such as NeWater, even after their official end and, of course, the value of a well maintained project website. More information on this event can be obtained from Matt Hare [hare (at) gmx (dot) de] and Nicola Isendahl, [Isendahl (at) wgl (dot) de]. Matt Hare is currently working as an independent consultant in Mexico, specialising in projects supporting adaptive and participatory water resources management. Nicola Isendahl is currently working at the head office of the Leibniz Association as personal assistant to the president.